I'm really not sure where to begin with this book. It's been shortlisted for the Man Booker Prize, so I don't know what it means that I didn't like it when so many others thought so highly of it. The writing felt disjointed, as did the timeline. I've seen some people refer to it as a book of short stories and, perhaps, that's where the disjointed feel comes from. I went into it thinking it was just a novel. 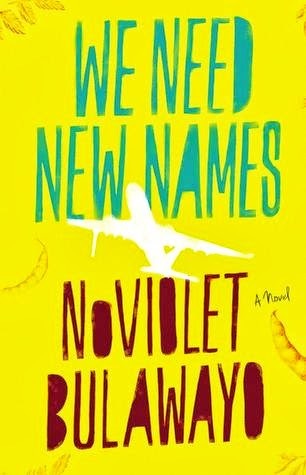 We Need New Names opens with Darling and her friends venturing to a nicer part of town to steal guavas. Once the children of parents that lived in nice houses with food on the table, they've been reduced to being vagabonds. These are children that have seen more than they really should have at such a young age. While the others seem to be hopeless, Darling has an aunt in America that she looks forward to visiting. In her mind, America is the promised land and by going there, she'll once again have decent food and shelter. Darling's time in Zimbabwe is much more colorful and interesting than her time in America. It's hard to tell if her sullen moods are because she dislikes the world she found or because she's a typical teenager. At any rate, America is not the promised land that she thought it was, and she seems to be stuck in limbo, romanticizing her life in Zimbabwe and wishing that she could return to it. I have no way of knowing if Bulawayo wrote We Need New Names with the idea that people around the world would read it. It could be that she thought anyone picking up the book would be familiar with the history of Zimbabwe. And though I was familiar enough to know why Darling and her friend's families had lost their homes and jobs, it would have been helpful for the author to go into just a little detail about it. The average reader may not have known why that was the case.